It's the first day of July. The second half of the year starts today! What are you planning to do for the rest of the year? It might be a good time to try a new craft beer and get ready for the big holiday weekend ahead. It is also Zip Code Day and U.S. Postage Stamp Day. North of the border it's also Canada Day. Here's what's happening around the Colorado beerosphere today Tuesday, July 1st, 2014. If you aren't reading this article on FermentedlyChallenged.com, you don't know what you're missing. Don't Drink & Drive - A friendly reminder that state and local police patrols are beefing up DUI checkpoints this week for the upcoming holiday. If you choose to enjoy a craft beer or two please be sure to bring a designated driver with you or call a taxi to get yourself home. It's not worth the $10,000+ in fees, fines, and embarrassment when you get caught. Parry's Pizza (4 Metro locations) - Get $3 pints of craft beer for the month of July. Check them out and share this with your friends and enemies. Highlands Ranch, Greenwood Village and Castle Rock locations. Sierra Nevada Brewing's Torpedo Extra IPA, Alaskan Brewing's Alaskan Summer Ale, AC Golden Colorado Native, New Belgium's Sunshine Wheat, and Jacob Leinenkugel's Summer Shandy. More info and locations at www.parryspizza.com. Sanitas Brewing Co (Boulder) - [PRESS RELEASE] Sanitas Brewing Company is proud to announce a new event that looks to ignite the summer scene by bringing together the elements that make Boulder unique. 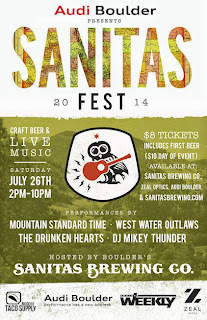 On Saturday, July 26, 2014 Sanitas will turn on the sounds of summer with a large music festival powered by nationally touring bands and locally made beer. The event will transform Sanitas Brewing Company’s central Boulder backyard into a vibrant summer music festival, including booths from area vendors. Four incredible musical acts will perform throughout the day while Sanitas Brewing Co. and five local food trucks deliver the craft beer and handmade eats. 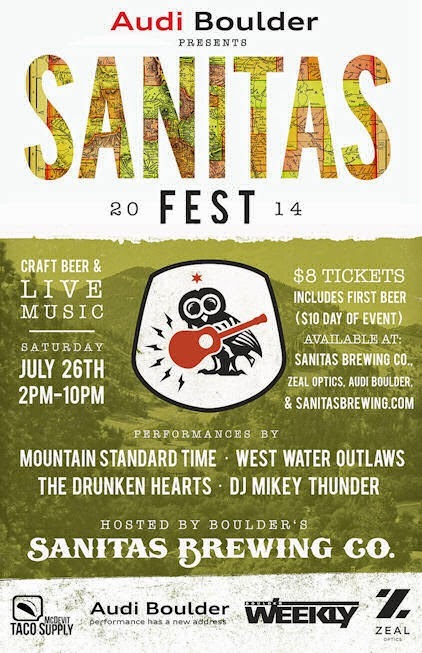 The inaugural Sanitas Fest will feature performances by Rocky Mountain “freegrass” group Mountain Standard Time and high energy rock ’n rollers West Water Outlaws. The Drunken Hearts will add their eclectic jam-style tunes to the evening while DJ Mikey Thunder is set to bring his electronic grooves to the mix. The festival will open at 2pm with the acts kicking off shortly thereafter and continuing into the night. Broken Plow Brewery, Wiley Roots Brewing, Crabtree Brewing (Greeley) - The Stampede continues all this week and so does their special Collaboration Pale Ale promotion. Each brewery collaboratively brewed the same batch of beer at each of the 3 Greeley breweries and then finished off the beers uniquely with a dry hop of their choice. Which one is your favorite? Get a punch card and visit each brewery and try the Stampede Pale Ale. When you get to your third brewery you'll also get the special 3-brewery logo glass to take home! Get yours while they last.